I apologize for making you all wait. It's a very long post and if you want to understand the situation properly, you will have to read it through. Here's an explanation of today's appointment. Tehilla had her vitals taken which were all great, except for her heart rate which was at 70. I realize that I haven't given enough of an explanation about heart rates to help understand what is going on with Tehilla. So, let's start at the beginning. In an average child, and was also the case for Tehilla, a healthy heart rate would range anywhere between 60-140 beats per minute. 60-80 would be when a child was sleeping and in very reduced activity. 120-140 would be at the height of a child's activity: running around the playground, crying and throwing a temper tantrum...things like that. Throughout the regular flow of a day, when there is just regular activity and tasks, it would range between 90s and 120s. I hope that is clear for understanding the contrast between an average child (and what was normal for Tehilla) and what is going on now. Tehilla had her echo with the technician. Everything went very very well. Very. Extremely. Her heart function is great! Her fenestration (the hole left during the Fontan for mixing bloods) is working wonderfully. Even better than seen on the previous echo. Everything looks great. Dr. Golander came in and looked over everything and quickly scanned a bit more with the echo. He looked over all of the results and started, "Right. Okay, it's like this..."
He then explained that her echo was amazing and he was very pleased. He asked questions about how she was doing at home. My response was that she has been doing very well. Her energy level is fantastic. I even joked that maybe it's a little too fantastic, to which he laughed and apologized for that. She does not seem to tire easily, like she used to. She does not get out of breath often, unless there is a good cause. She is happy, destructive, and playful. Everything a nearly 3 year old should be. She sings and dances, does crafts, destroys laundry piles and colors on the wall. Perfectly normal behavior. Her color has been this (for me, mind boggling) perfect shade of light pink. I find myself marveling at the color of her skin about once a day. I was so used to shades of purple and she just looks so....healthy! Her fingers and toes were almost always deep purple and now, they are a fabulous shade of skin tone. She still complains every other day of pain from the surgery and when we have stopped giving her Fenestil (antihistamine) at night or Optalgin (pain killer), she doesn't sleep peacefully and will wake up and complain of pain and/or itchiness. So we have been giving it to her nightly and will wait a few more days to try a night without it. Dr. Golander was pleased with all of this. "So, let's talk about her Holter monitor results..." Her results came back and showed that her heart rate ranged between 40-90. When she was sleeping it stayed in the 40s and 50s and when she was at her most active peaks, it went to 80s and 90s. Her average (mean) heart rate was 69 throughout the course of 24 hours. She had only one point where it seemed that her heart skipped a beat and that was for 1.9 seconds. Since, this isn't usual, Dr. Golander consulted with an Electrophysiologist specializing in pediatric cardiac patients from Schneider's Childrens Hospital in Petach Tiqvah. His name is Dr. Bender and he is considered to be the leading expert in the entire country. 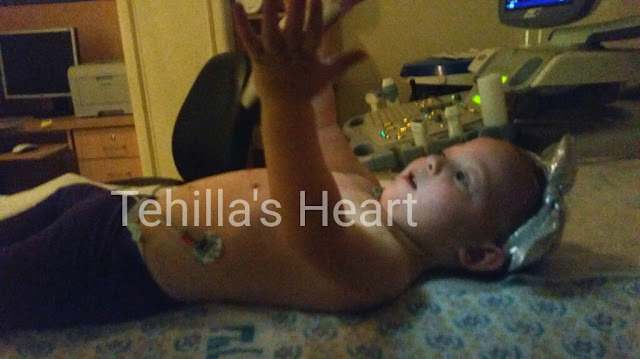 Since we are having a problem with the electric circulatory system in Tehilla's heart, he is the specialist needed. Tehilla's heart function is great. Absolutely wonderful. Tehilla's well being and stability are fantastic. So, now it comes down to heart rate. The scale that Dr. Bender gave was: If the heart rate average (mean) is above 70, we don't do anything. We leave it alone and watch and wait. If the heart rate average is below 70 then a pacemaker is needed. Tehilla's average is 69, which is for all intensive purposes about the same as 70. So she is right at the border. Therefore, she does not need to have a pacemaker put in immediately. We will watch and wait. Wait for what? Wait for her either to get worse or get better. Her heart rate can stabilize and get stronger and then she will be fine. Or her heart rate can deteriorate and then she will need a pacemaker surgery. We will keep a close eye on her and watch for any physical signs of her health deteriorating, such as being out of breath, fainting, not feeling well overall, being low on energy...etc. If we see anything like this, we will call our cardiac nurse and go straight to the hospital. She is to carry on with life as normal, meaning she will go to school and have a normal routine- but we and her teachers will have to keep a careful eye out. Every two months, she will do another Holter monitor and come for an echo to see how she is doing and to make sure her heart function is okay. So, we are basically neither here nor there. We are hanging in a balance of unknown and things can shift to either extreme. We are blessed beyond measure that it wasn't an emergency pacemaker surgery. But we have a lot to pray for. We- our entire blog family- needs to pray that Tehilla's heart rate improves, that she does not need more surgery, that she can continue to thrive and get stronger every day. I'm praying. Hopefully by the next two-month check her heart will have got stronger. Lots of love. Gd willing, only good news. I thank HaShem that she is doing so well and that she will continue to improve over time. Blessings.